Lali with cheeks full of grapes! Look at how well she uses her hands!!! Lali and Christopher on an ice cream date! Dave dragged Lali around the room as she squeeled with delight! Buddies! Lali and her Chelsea. Michelle can run but she can’t hide! Get her Lali!!! 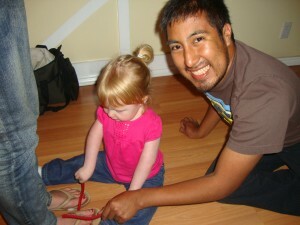 Lali wanted to drum WITH Jared USING licorice sticks ON Lauren’s feet. Perfectly reasonable request, right? 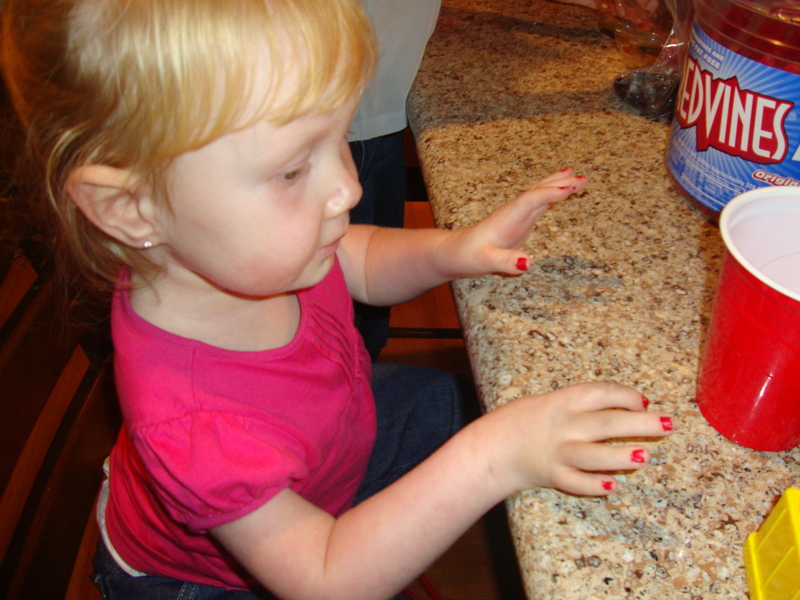 Grandma Deb says that her nails need to match her walker, so voila! 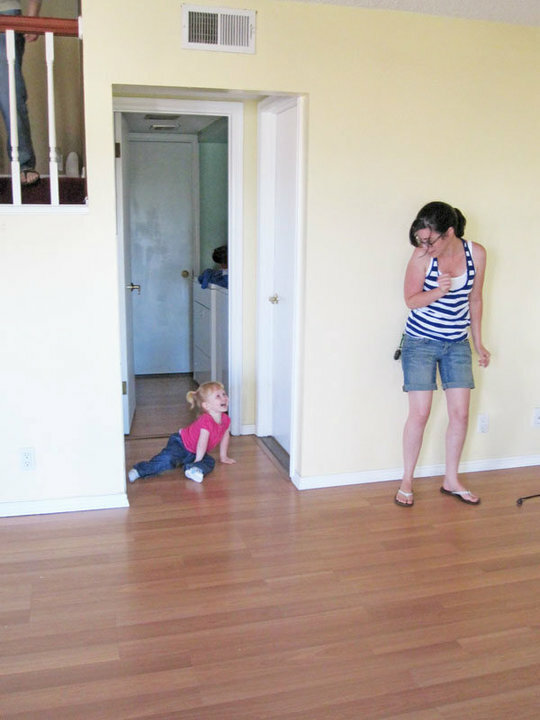 We asked her to go backwards… Use your legs, child! Not your head! Haha! Ram into Adam! Good girl! We are very thankful that we get to semi-permanently borrow a walker for free practice with it at home! From what I understand the company who loaned it to us are hoping we get our power wheelchair through them and make them lots of money. 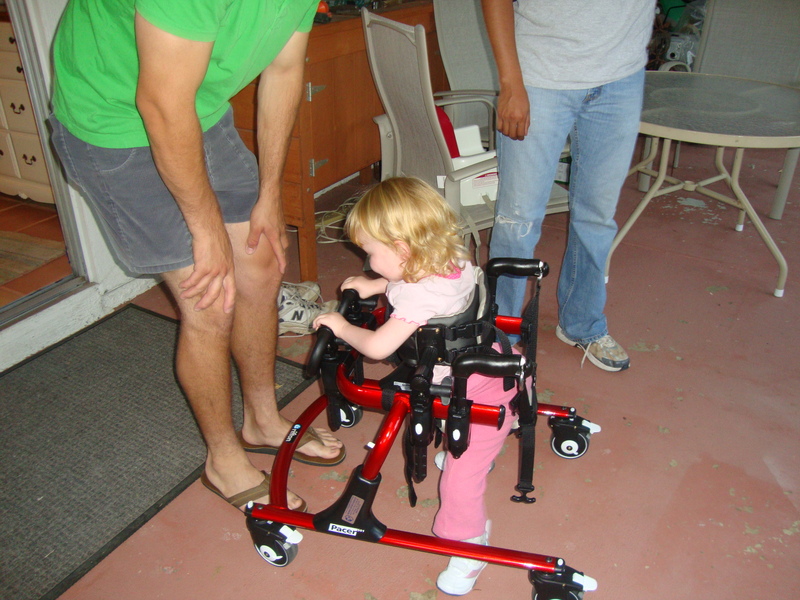 And if we can only get one big piece of hardware with the help of insurance, they want it to be the expensive power chair and not the semi-expensive walker. So it’s in their best interest to let us borrow a walker for as long as we need it. Cool, eh? 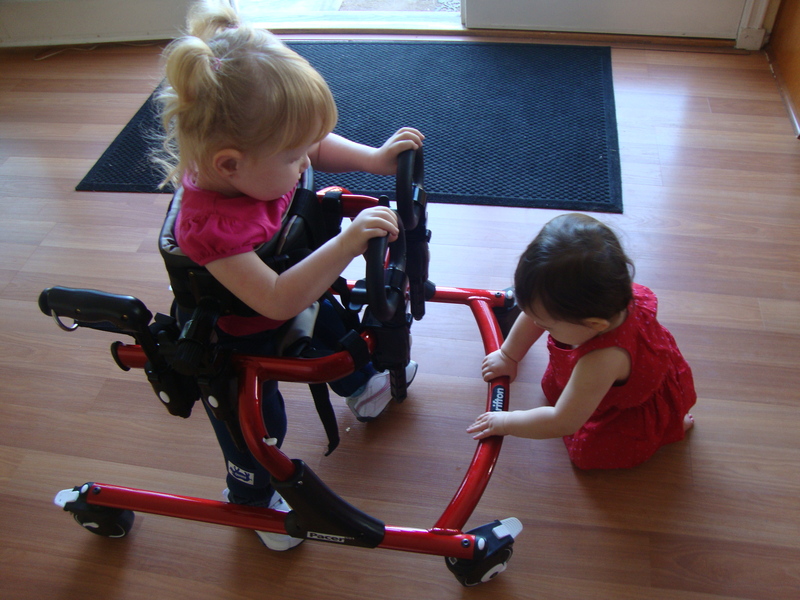 Best of all, our friends have helped encourage Lali to use it even though it’s hard! 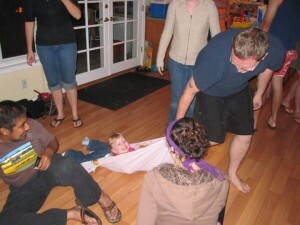 Lali saw Grandma Deb and Grandpa Gary on Friday and had some walker fun on their back porch. Chelsea offered to lug it with her when she watched Lali that morning. Then we went to a double birthday party on Saturday and Lali got to use it around all of the party guests who cheered her on. I think we’ve figured out the perfect walker combination: hand grips facing up, one knee immobilizer on her right leg (since it has the worse contracture), the left side of her seat hitched up (where her hip has the worse contracture), the back wheels locked so they can’t turn, but so they can go backwards, the front wheels able to turn all directions and a nice level surface that’s not carpet. Even still she moves very slowly if at all. Still, it’s neat to see her upright! While we were at PT and OT we met our friends: Rosa and her mom, Leslie! So how do we “meet” friends? Well we became friends online, but had never met in person before! (Um, I have a LOT of these kinds of friends.) Here is a cute picture of Laelia and Rosa. 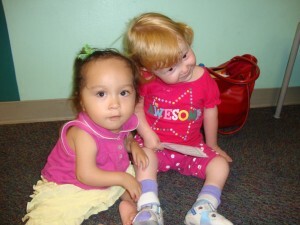 Rosa has arthrogryposis too. For whatever reason it’s the only picture that came out. They were giving each other hugs and kisses. So cute! Lali wouldn’t let go of her PT slip that she has to hand to her therapist so it was hard to give hugs. We also signed some hospital paperwork saying that Children’s Hospital can use Laelia’s pictures for anything and everything. I can’t help it if they think my daughter is super beautiful! I guess they end up using her pictures a lot. Apparently they have a good one of her at four months old in splints that they used at some official function and needed to make sure I was still cool with that. Laelia’s pictures also go with our OT who is a hand specialist to her lectures in other parts of the country. 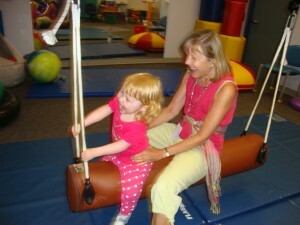 So in exchange for Lali’s picture, I got a couple pictures of Lali and Jill (our OT) doing therapy. Therapy is fun!… You know, for Lali too. So all in all a good day at Children’s Hospital. An aide helped me into my car with the walker. The darn thing doesn’t fit in the trunk so we had to load it into the front passenger seat. I drove home with one of its front wheels in my face the whole time. I managed to get all the way into my apartment complex parking lot before bursting into tears. Thankfully Lali was sound asleep after such an eventful day. I don’t know why I was so upset to the point of balling. I can’t tell you if it was gratefulness at getting to use a walker or if it was pain at the reality that my daughter needs a walker and looks “more disabled” with it. Or maybe it was a combination of both. I figured I’d get all my tears out in the parking lot instead of bombarding Charley with them, especially when he’d likely ask what was wrong and I DIDN’T KNOW, but my car was not as private as I thought. The neighbors, a family of three, caught me. The dad helped me carry the walker inside while I carried my sleeping beauty. They didn’t mention the fact that I had a walker (even though I don’t know for sure that they know about Laelia’s condition), and they didn’t ask questions. They just smiled and helped me carry stuff through our shared gate. For some reason that was comforting. It made having the walker less awkward. It helped my mind to make the connection that the walker is a good thing–a good, helpful thing–and an everyday thing. It helped me feel normal. I think for someone to achieve that act of magic–making me of all people feel normal–then God must have been helping to quell these emotions before I could even put a name to them. Laelia gets up on her knees!!! Once again Laelia does something she’s never done before! Something we didn’t know if she’d be able to do! Something doctors said wasn’t likely or guaranteed to happen! She’s standing on her knees all by herself!!! And here’s the video of how she got there all by herself! Grady has found a family! So a while back I posted a blog about this great little boy who needed a family. He is on my heart a lot. In fact we briefly looked into adopting him. That’s affordable and easy, right? Um, no. The other day when I found out that a family was interested in adopting him I cried my eyes out. Part of it was beautiful relief since not being able to bring him home myself left me racked with guilt. But another part of me was sad because he wasn’t mine. I used to think that people were dumb to fall in love with a picture on a website. But that’s what I did. We had just been given some bad information about our chances of having another child with disabilities. I had signed up on different adoption websites just as a way of coping with the news. I found Grady when I wasn’t looking for more than just information. I stopped and scrolled back up because he looked just like my daughter! Then seeing he had arthrogryposis was like some sign from above that I would care for him, or at least care about him. I had already picked out all his doctors, therapists (OT and PT) his surgeon and had a game plan for his legs before we requested more information on him. But when it came down to it, all we could do was give a few dollars to his fund. He wasn’t coming home with us. But reading about his new family is a comfort. His mom is even originally from Southern California! They already have a daughter too. They sound absolutely wonderful! 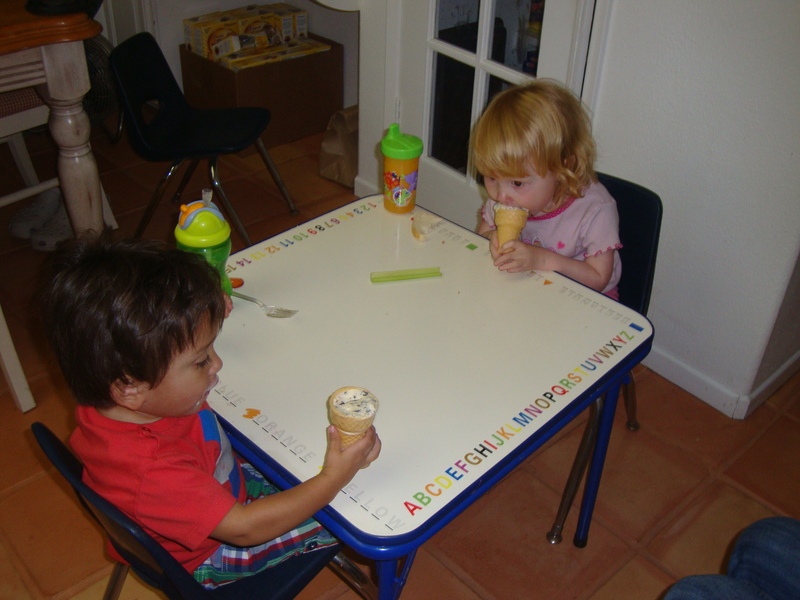 Here’s their story from Reece’s Rainbow’s website. 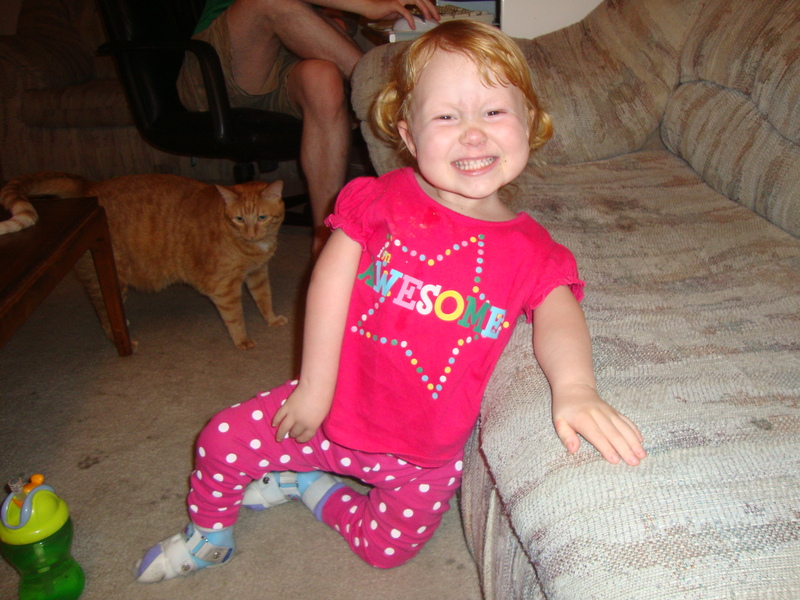 Here’s the family’s blog with a new picture of Grady looking adorable. 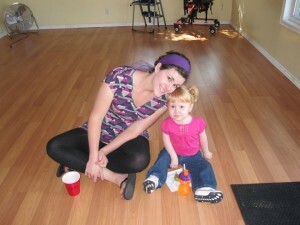 This family is in their first steps of the process and need support! Please consider donating toward the cost of their adoption by going here. Every little bit helps! I really hope one day Laelia and Grady meet and become friends. I hope to see this family at the annual AMC convention or connect with them on amcsupport.org. Laelia already loves Grady and his pictures online so it would be an easy friendship. I don’t usually post pleas on this site, but felt it was appropriate. We have two friends who specifically are in need of help. Good people. I hate to do nothing for them. Our first friend is JJ (Jared Joshua). 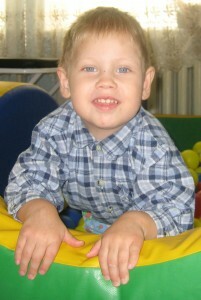 Jared was born with congential hydrocephalus and arthrogryposis. Obviously I know his family through our arthrogryposis connection, mostly on Facebook. Like Laelia he has club feet and is unable to move his legs, but unlike Laelia he also has severe hearing loss, a g-tube and the family just found out he is missing two important structures of his brain. Between that and the fact that he started having seizures, his family has been thrown for a loop. Only a couple days ago did Jared double his birth weight. He’s almost a year old. They would like to take him to the Family Hope Center which specializes in children with brain injury. They need to raise about $4,000 to cover all expenses. Their Pay Pal account is jjo91009(at)gmail.com. You’ll have to use the actually @ symbol there instead of (at). Or email me at recordsky(at)gmail.com and I can get their home address to send a check to Jared’s mom if you’d prefer. Every little bit helps! By the way Jared is adorable! 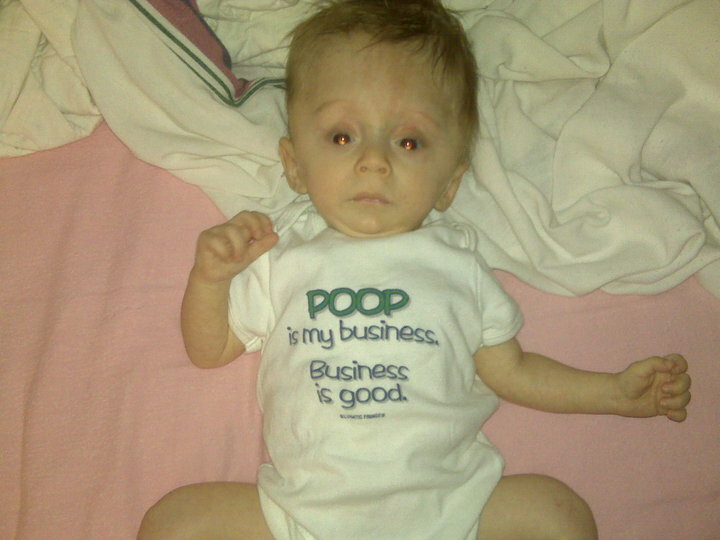 And his parents have some of the best attitudes and senses of humor. This family deserves good things! July 21st: Kourtney checks into UCLA for multiple transplant surgery. 1:00 pm: Her organs were in place! She would still be in surgery for several hours. And then in a drug-induced coma for a couple days as they left her stomach open for more work on her bladder. 3:30 pm things were going beautifully then her new intestines started to clot. 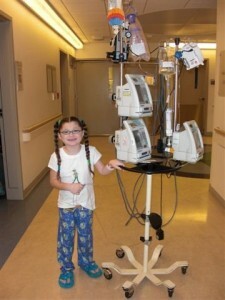 6:00 pm the clotting had stopped and she was in ICU. July 22: Kourtney had been in surgery for most of the day and was now in the ICU. Today is her 8th birthday. 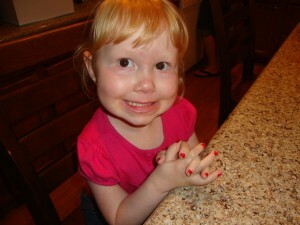 July 23rd: Kourney had high blood pressure through the night, but they prepare for more surgery today. On the way to the OR she had breathing trouble and they had to bag her. They pray her intestines will continue to cooperate. 4:00 pm they finished surgery but were unable to close due to swelling. July 24th: Kourney’s new pancreas is not cooperating; it doesn’t like sugar. They upped Kourney’s pain meds. July 25th: Kourney is no longer incubated; she’s just on oxygen! A blessing. July 26th: They found a burn on Kourney’s back that they suspect was from the operating table. July 27th: Kourney has an infection. White blood cell counts and liver counts are down. July 29th: Kourney is rushed to the OR because of infection and pain issues. In the OR they find internal bleeding and infection. Her new bowl is bleeding and her stomach also. They give her blood and it helps. She’s incubated again. 2:00 pm: Kourney’s stomach is extended and she has a lot of medical intervention to keep her going. The decision is made to keep her unconscious for 24 hours. July 30th: Kourney continues to bleed from her large and small bowl. Her parents wait to see if she’s in rejection. 2:30 pm: Bleeding slows. Kourney gives her mom a thumbs up. But her kidneys have taken quite a hit. July 31st: Doctors think bleeding has stopped. They consider taking out her breathing tube. August 1st: Kourtney is in a LOT of pain, and she’s puffed up from fluids. August 2nd: Kourtney is in a scary place. The fluid build up in her body has caused renal failure. She was in too much pain so she was sedated. 3:00 pm: Kourtney’s bowls are in rejection. They have to put her back on the transplant list. 10:00 pm: Kourtney’s kidneys are now failing. August 4th: Kourtney goes back to the OR to get a line to start dialysis. Her mom is so stressed out that she’s sick. 9:00 pm: Kourtney’s new line is not working. It’s going directly into her heart! They need it fixed ASAP. August 6th: Kourtney is bleeding, in pain and going through rejection. August 10th: Kourtney crashed during surgery. Things are bad, but she lived. August 13th: Kourtney went in for emergency surgery. 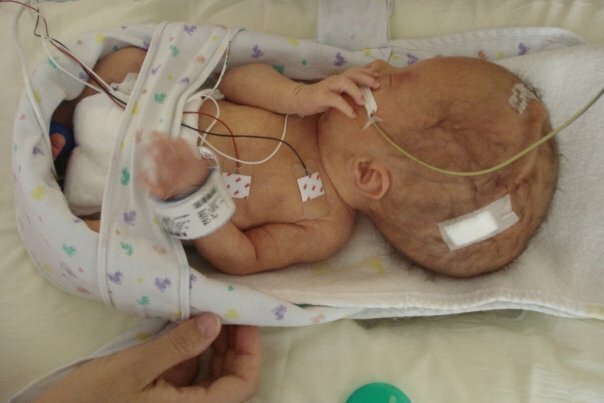 She has another perferation in this new bowel, and they were not able to save it. She already was re-listed, but now is more urgent. Kourt is in a lot of pain, so the docs have put her on high doses of fentenayl. August 15th: Kourtney spikes a fever of 104. Doctors believe she is septic. Yesterday: Kourtney’s kidney’s start to work again! She starts to put out a small amount of urine. She has a fever, but things are looking up. 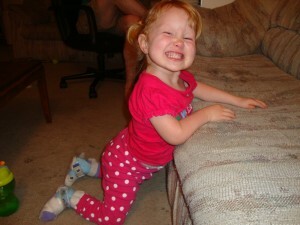 To continue to follow her story you can friend “Kourtneys Krew” on Facebook. During all of this Kourtney’s friend Emma was admitted into the hospital too. Also Kourtney’s family found out that a beloved nurse friend had passed away. Dark times. I have permission from Kourtney’s mom to share the following address if you wanted to send them a check to help them survive the next month. They do need it! After posting the video of Laelia putting on her sunglasses I had a lot of quality discussions with different people about Laelia’s videos. But let me start over from the beginning. My husband and I decided long ago that this blog would be honest. That’s why it sometimes has a dark edge to it with anger, fear or doubt. Then other times it’s exciting–with new accomplishments and naked joy! If a subject can’t be shared honestly, it is left out of this blog. After the sunglasses video I realized that I have not always met my standard of honesty in the videos I post when they only show a victorious end result. In true Hollywood style, I have chosen quality, brevity and beauty over reality. There were several attempts by Laelia at donning sunglasses that ended in failure and tears before I caught that one video I shared with the world. In fact when someone commented on how Laelia never complains, based on what they had seen in her videos, I had to admit that she did, in fact, complain. A lot! These things are not easy for her to do. Then to my surprise this person said she’d love to see those videos too! It always overwhelms me when I realize that people love my daughter even when she’s not the poster child for grace through trial. In this vein I have a beautiful video of my daughter mastering something that has eluded her for a long time now: climbing over a stair. It’s a video I wouldn’t normally share since Laelia’s hair is a mess, her several attempts end in failure and she cries her heart out in frustration. But I think through the gritty reality, you’ll come to know a little lady who persists; she tries again when her energy is low and her weak muscles are screaming at her. And I hope you feel with me the need to run up and help her as the camera inches closer. 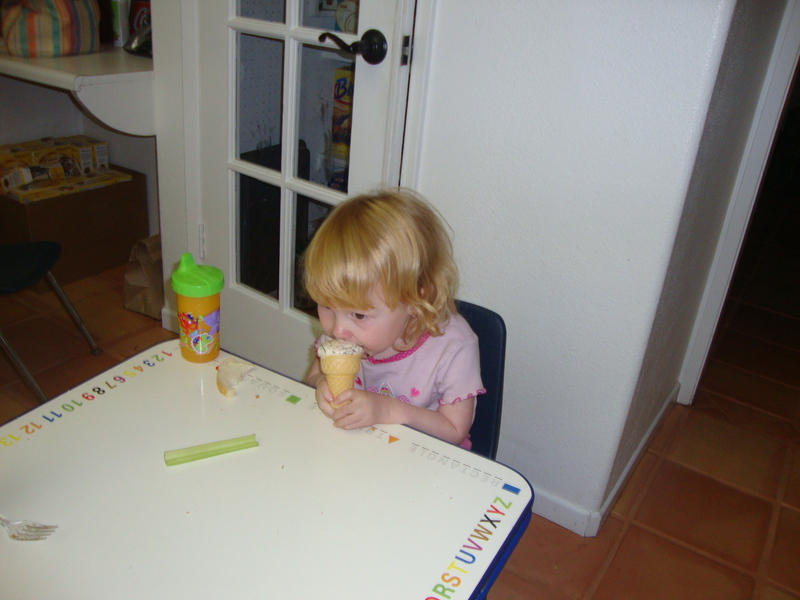 It’s downright mommy torture to let her succeed or fail on her own! I’m actually crying as I write this! So here’s the video. Just click on the picture below to see it. The picture was taken right after I finished filming. She announced, “I tired now,” then fell backwards and made fake snoring noises. I like this picture because it captures what she was too shy to show while being filmed: joy, pride and exhaustion. 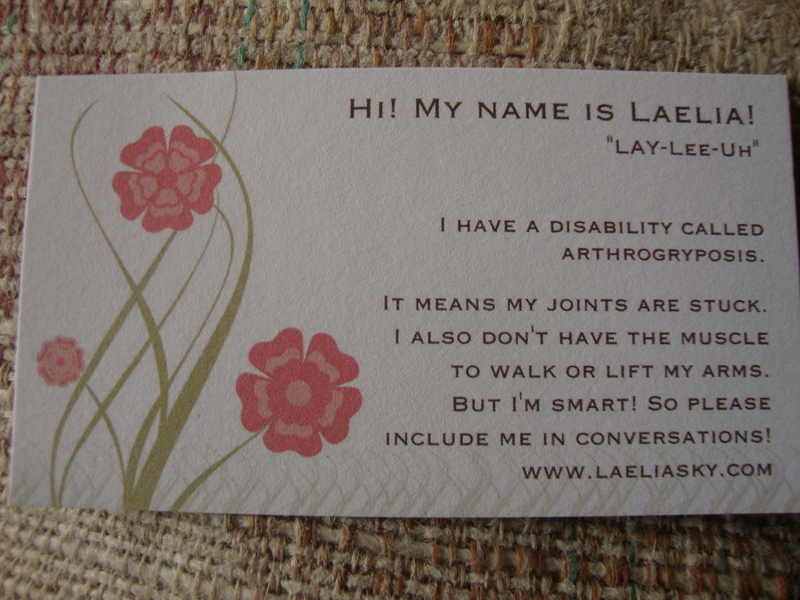 Having Laelia hand these to people has been so great! 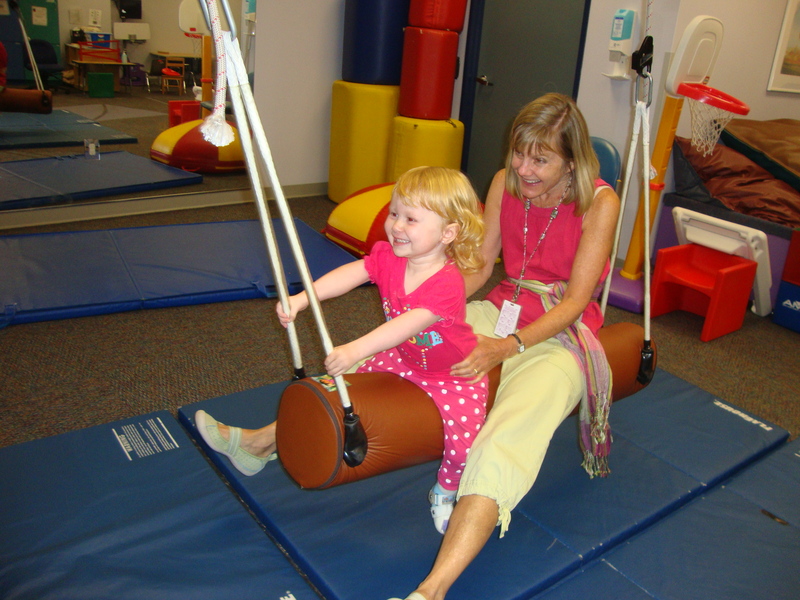 It provides an instant explanation of her disabilities without me having to explain to yet another person about arthrogryposis, but it also opens up an instant, informed dialog. 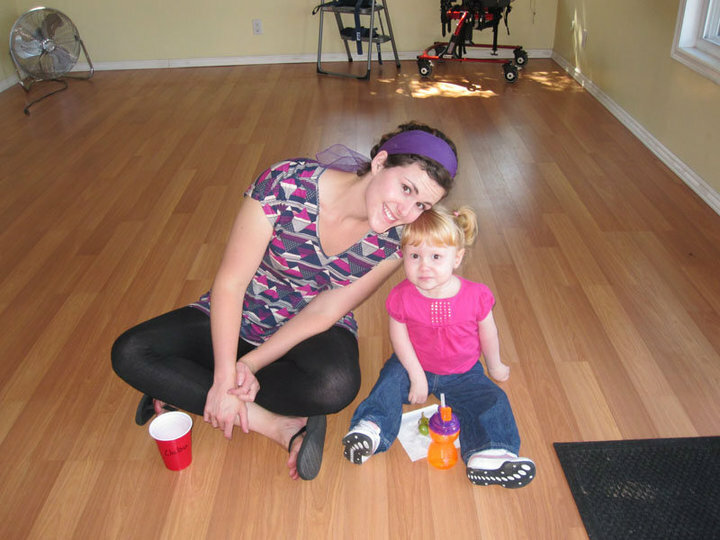 It has helped people who have never dealt with disabilities avoid saying things like, “What happened to your daughter?” or “Why can’t the little girl lift her arms?” that us moms HATE responding to constantly. (The zoo and grocery store hold the biggest offenders!) It also clearly states that I want my daughter included in conversations. A lot of people ask me “harmless” things in front of Laelia about Laelia. But not after they read the card! Another mom (the one who started the AMC support group) told me that business cards would smooth over first time meetings with people. I thought it was a cute idea, but I never thought I’d go through so many of these things! I had 250 cards made for free online (cost me $5.99 for shipping) and already I have handed them to strangers, gym childcare staff, people who work within special needs communities but have never heard of arthrogryposis, and in November I’m handing them to airline employees! 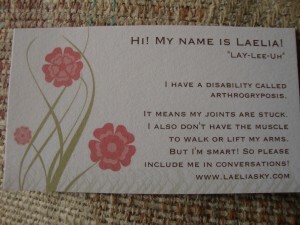 Actually the business card suggestion was made after I shared our not-so-great experience with a flight attendant during our first trip to Shriners to get Laelia evaluated for surgery. This head flight attendant with Continental, Cindy, demanded that my daughter stand instead of sit while waiting for the bathroom at the rear of the plane. At first I geared up for a teaching moment (which happens way more often than I would like in the real world), but she got so mean so quickly (telling me that allowing my daughter to sit on the dirty floor was awful, and otherwise demeaning my parenting) that I was choked up with tears before I could blurt out the painful truth of our situation. I tried to tell her that this was how Lali “stands” because she’s different, but before I got the full sentence out I was shot a look that was incredulous and outright mocking, then I was bluntly ordered to pick up my child NOW. And that was when Laelia began to cry. I overheard that awful woman talking about us as we were back in our seats (a mere few rows from the back, row 34 of 37). Her fellow employee had to explain to her why the little girl didn’t stand. The woman became even more incredulous and said we should have sat in a different seat then. When I’m emotional (angry, sad, hurting etc.) I can’t educate. When I can’t educate then hard-headed people can take advantage of us, and hurt my daughter’s feelings. So this card was made with Cindy in mind. But thankfully it’s been used effectively to avoid Cindy-type situations. Got a call today and Laelia’s surgery is now scheduled for November 16th. (She’s having the bilateral proximal femoral reorientation osteotomies.) Apparently they decided they needed more time for her surgery than November 11th’s schedule allowed for. She’ll be surgery #1 for that day (since she’s the littlest! ), so we will need to show up at 6:30AM that morning. I emailed the Miracle Miles people about transportation this afternoon. In fact I had my finger hovering over the send button on an email to them when the nurse coordinator rang my phone to change the surgery date. Excellent timing. Now we are requesting to fly out on the 15th instead of the 7th. November 16th gives us a tighter schedule which has its pros and cons. Mostly I think this change is for the better, and that makes me happy. Or it could be all the chocolate chip cookies I just ate. Either way… GLEE! Laelia is doing so much better! I’m so glad that it wasn’t as bad as last time. 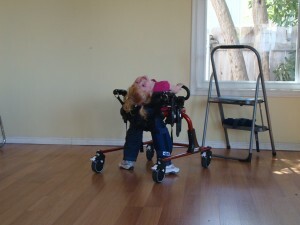 The pain is connected to her left leg and hip and aggravated by picking her up or moving her. Two years ago she had the same thing only on her right side, and much worse for much longer. She did really poorly that first night of pain (Sunday night), but now (Tuesday afternoon) she hardly notices it at all! What an amazingly fast heal! We’re still careful with her, and I did accidentally hurt her last night carrying her to bed, but it’s so much better now that we’re not worried about her at all! I’m very thankful right now. I hate mysterious pain! I hate feeling so helpless! 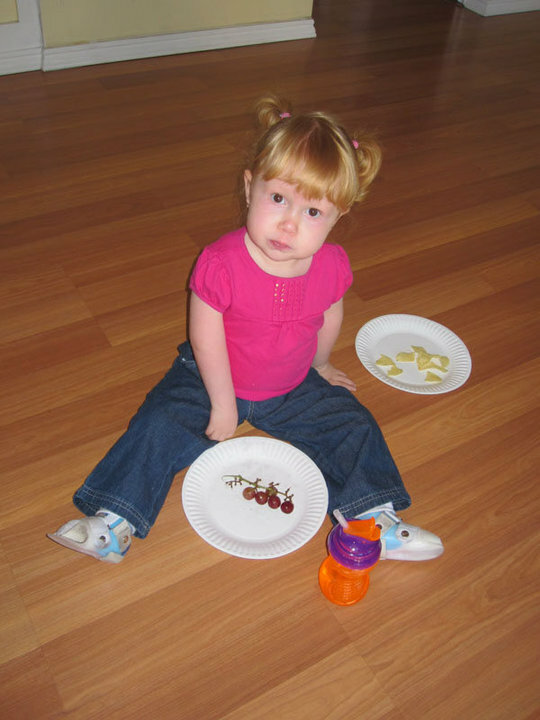 I hate when my daughter is hurty, and she gives me that adorable, pitiful face with the pinchy-cheeks and pouty lower lip. Acc! Just stab me in the heart! But thankfully this wasn’t as bad as last time. Nowhere near as bad! I really appreciate all the prayers and warm thoughts from my family and friends. Sometimes it’s hard for me to feel like God cares about these daily pains and heartaches of ours that don’t effect the rest of the universe. But if I think about it, I’m surrounded by people in my life who care! And I have to give him some credit for that, since I could never have attracted people of this caliber on my own. I hope to handle these situations in a way that shows God I care too. I care about the things and people he cares about. And that means I VERY MUCH care for my daughter, who has to be one of his favorites.